Robert Burns; A Memoir by James White. Everybody knows the name of Robert Burns, but, as in the case of many others, the name is nearly all that is known. Robert Burns as a Poet and a Man by Samuel Tyler. A great poet, in the person of an Ayrshire ploughman, by the name of Robert Burns. The letters of Robert Burns extend over a large portion of his life : they are varied, vigorous, and characteristic. Robert Burns was born on the 25th of January, in a cottage near the banks of the Doon, about two miles from Ayr. The Poetical Works Of Robert Burns. Robert Burns, celebrated Scottish Bard, was born on the 29th of January, on the banks of the Doon, about two miles from Ayr. The national poetry of Scotland, like her thistle, is the offspring of the soil. 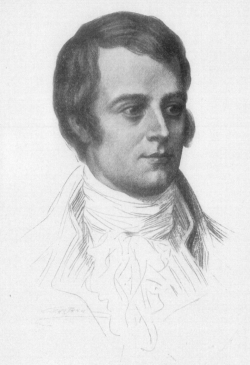 Robert Burns, the chief of the peasant poets of Scotland.